Three layers of the same luxuriously soft Bamboo as the Bamboozles nappies. Available only in the "Natural" colour. 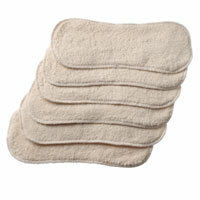 I like these as they are soft and can absorb a lot of liquid. It would be good if they were a little more shaped, then I would rate them a 5! Click the button below to add the Tots Bots Bamboo Booster to your wish list.